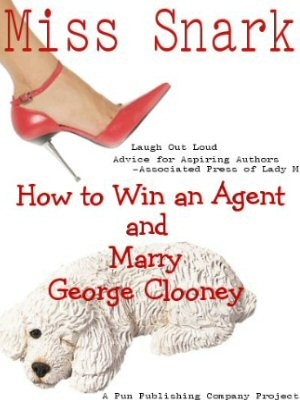 Miss Snark, the literary agent: More more more! If it's a matter of survival, a pseudonym is easy to come by. You sit around with a pail of gin and throw out names until something catchy surfaces. Fellow writers may be interested in Donald Westlake's grim (but hilarious)crime novel "The Hook." The protagonist is a midlist author sitting in exactly that sinking boat, and Westlake uses this as part of the premise for his story. Horrifying yet funny. Let's not forget how publishers often kill a midlist writer's career with each new book by printing on a downward scale. If the first book sold 9,000 copies out of 10,000 printed, rest assured book #2 is going to have a first printing not more than 9,000. This doesn't necessarily affect the book buying habits of booksellers but it most certainly tells the marketing and sales teams "this book isn't going to do any better than the first, probably worse." If there's even a book #3 in the works, it's likely not going to see the light of day. And writer and agent be damned if they try to take said book #3 elsewhere because no one will touch it. On the topic of pseudonyms - what about us poor souls with unpronouncable names? Is it better to have an "exotic" name from a marketing point of view or is it time to think of a name Redneck Joe wouldn't have trouble saying? Some folks claim it's more the big chain bookstores than the publishers--automated ordering based on sales of previous books by the author, which automatically ratchets down the number of copies requested if there were returns previously. I don't know the truth of this, but I've heard Barnes & Noble and Borders blamed at least as often as the publishers. One of my wife's bridesmaids is a buyer with one of the two big bookstore chains (I also work in bookselling, though at the retail end), and this whole notion of an author's career being buried by the "computers" seems pretty odd to me. It's true that hard numbers and the bottom line are the single biggest factor, but my wife's friend basically spends her entire work week researching those numbers herself--it's human beings who decide how many copies of the book are going to be ordered for its first release, and human beings decide when a book has finally run its course and no longer needs to be reordered. The computers still handle a lot, but the decisions that they do make are still constantly being monitored by humans. In short, human beings are far more involved in every decision of the bookselling process than those who want to blame the chain bookstores seem interested in understanding.